Which Crack Cocaine Treatment Is Right for You? Does the Program Offer Medically Supervised Detox? How Much Does Crack Cocaine Recovery Cost? Does the Program Offer Aftercare? Which Rehabilitation Program Is Right for Your Teen? Crack cocaine is a remarkably addictive stimulant drug. It can be extremely difficult for users to quit. A large part of the challenge is due to the severe withdrawal symptoms that appear when the drug is stopped or hasn’t been used in a while. Frequently, crack cocaine abusers who try to get sober relapse due to the strong cravings they experience with quitting. Need Help Finding a Rehab Program? Who Answers? to speak to a treatment support specialist, who can help you locate a treatment center that meets your needs. If you’re suffering from a crack addiction, it’s crucial that you ask some questions before choosing a rehab option that’s best for you. Once you’re familiar with the different forms of substance abuse treatment, you can pick which option is most suitable to you and your needs. The Matrix Model is a 16-week, outpatient treatment model created for the treatment of crack cocaine addiction, and various other types of stimulant dependency. It promotes self-worth and self-respect, while delivering support, encouragement and education to the patient. Inpatient or residential treatment centers allow you to focus solely on your recovery, free of many of the distractions or obstacles to recovery that may occur at home. You live at the rehabilitation center for the duration of your treatment and receive 24-hour supervision. Inpatient treatment may be the best option for those suffering from a severe crack cocaine addiction and who wish to escape the temptations of everyday life. Many programs offer 30-day, 60-day, and 90-day inpatient treatment durations. However, treatment length is dependent on a number of individual factors, and can be adjusted to fit your specific needs. Preliminary or initial assessment. A therapist will evaluate the severity of your addiction as well as assess for any co-occurring mental health disorders. Based on these preliminary factors, an addiction treatment professional will begin to build an individualized treatment plan. Medically monitored detoxification. In many treatment centers, health care professionals provide around-the-clock care to ensure you are comfortable during crack detox. Although there are no current FDA-approved medications for the treatment of crack cocaine dependence, there has been extensive research on a multitude of medications that may prove to be promising in the future. Group counseling. 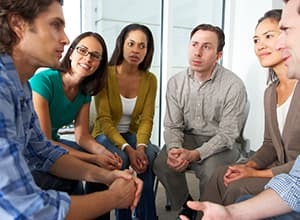 You participate in group sessions led by an addiction therapist or counselor. During these sessions, you are encouraged to discuss the root causes of your addiction and help others work through their own issues. Individual therapy. A therapist meets one-on-one with you to help you identify the issues that led to your crack cocaine use and helps you with behavioral modification and other coping skills. Aftercare. Once you complete the inpatient program, therapists will devise a plan for you to maintain a sober life, which could include ongoing individual therapy, support groups, 12-step programs or all of the above. Inpatient crack rehab may be the best option for those suffering from a severe crack cocaine addiction. Residential. You live at the treatment facility while receiving necessary care and rehabilitation. Luxury. These facilities are more expensive and more closely resemble a resort or a vacation, with added amenities and recreational features. Executive. These inpatient treatment centers are similar to luxury ones, except they are more focused on catering to working professionals who are unable to place all business matters aside while going to rehab. Intensive outpatient. These programs offer many similar services to inpatient programs. They focus on relapse prevention. Intensive outpatient programs usually meet at least 3 days a week for 2-4 hours a day or more. They can usually be scheduled around work or school to accommodate daily schedules. Partial hospitalization. These programs are meant for people who need medical supervision or access to other hospital services, but have a stable living situation. They usually meet at the hospital for 3-5 days a week for at least 4-6 hours per day. Therapy and counseling. Therapy and counseling help you to uncover the cause of your crack use, learn healthier coping skills, repair relationships and develop a plan for sober living. Cocaine Anonymous. A fellowship that uses the 12-step recovery model to promote sober living and recovery. Recovering addicts share their experiences and support one another throughout the process. It doesn’t cost anything to join. The only requirement is that you must have the desire to quit using cocaine and any other substance. Non-12-step-programs. Support groups for those looking for a more secular approach to recovery focused on empowerment. Residential facilities tend to cost more because of the on-site living accommodations and around-the-clock care. The price may also depend on location and length of stay. Outpatient therapies tend to be less expensive but aren’t often recommended for those suffering from more severe crack addictions. Those suffering from a substance abuse disorder often have a mental health disorder, as well. These individuals are said to have a dual diagnosis. Simultaneously treating both the mental health condition and substance use disorder can help maximize recovery chances, and minimize the risk of relapse. Some facilities specialize in dual diagnosis treatment, so this is something you should consider when picking the right crack cocaine recovery center. Detox is first step in substance abuse treatment. It is a process that rids your body of crack cocaine and prepares you for treatment. Detoxing from crack on your own can be both mentally and physically trying, which is why inpatient treatment centers provide medical supervision in order to ease the symptoms associated with crack withdrawal. Whether the program is inpatient or outpatient (inpatient tends to cost more). The location of the program (urban programs are generally more expensive). Whether the program offers special amenities, such as spa treatments, a location near the beach, massage treatments, tennis courts, etc. Call 1-888-319-2606 Who Answers? to speak with a treatment support advisor about whether your insurance will cover partial or full substance abuse treatment. Crowdfunding. Websites such as GoFundMe and IndieGoGo allow you to create a campaign in which people can donate to help you finance your treatment. Treatment center payment plan. Facilities often understand the distress of having to pay hefty treatment amounts. They will allow you to pay a certain amount each month that you are comfortable paying. The main focus is recovery, and they will work closely with you to create a plan that works best for you. Use personal savings account or retirement fund.If you have a savings account, consider using that money to finance your recovery. If you don’t have enough in your savings, you could borrow money from your retirement fund. Apply for a loan. Some companies specialize in loans for those seeking drug abuse treatment. These loans have lower interest rates than health care credit cards. This option could remove the stress of paying upfront and will allow you to focus solely on your path to recovery. Who Answers? to learn more about treatment options for crack addiction. Aftercare is any care that you receive after completing treatment and is designed to help prevent relapse. Aftercare is just as important as the initial treatment that you receive, as relapse is very common in those who are released from rehab. Without proper follow-up care and maintenance, the risk of crack cocaine relapse increases. These treatments help you to continue to build upon the healthy coping skills you developed in initial treatment. Aftercare does not last one designated time period; it can last as long as you feel you need it. Many people feel most comfortable attending aftercare treatments for a lifetime, and some may feel confident after a few months or years. Aftercare will help you promote positive change in your life and develop skills necessary to deal with life stressors in a healthy manner. Support groups such as 12-step programs or non-12-step programs. In addition to standard inpatient and outpatient treatments available, there is Teen Addiction Anonymous. This is a 12-step program inspired by Alcoholics Anonymous. It is focused specifically on teens suffering from a substance addiction. The group uses tokens as representations of the amount of time the teen has been sober. If you’re addicted to crack cocaine, help is available. Please don’t wait to call 1-888-319-2606 Who Answers? today and get connected to the crack cocaine treatment program that’s right for you before it’s too late.